This 150 Degree Outdoor Black Motion Sensing Decorative Lantern is durably make of metal construction with a weather resistant finish. It is designed with clear bevelled glass to minimize light output. Functional and practical, this motion sensing lantern has 2 brightness levels and a 30 ft. detection range making it a dependable security lantern. Uses 1 - 100 Watt Medium Base Bulb (not included). Covered roof with open bottom provides directional light around porch area and over doorway where needed. Open bottom frame adds downward direction lighting and makes it easy to change bulbs. Made with weather resistant finish and rust resistant metal. Hardwire installation required, instructions and hardware included. Corniche's artistic scrolls and scalloped hood with tapered finial make this collection a beautiful addition that will enhance the exterior of your home. This collection is beautifully finished in Burlwood and complimented by Seeded glass. This collection offers a fixture for nearly every application. 150 Degree Black 6-Sided Decorative Lantern with Clear Beveled Glass This 150 Degree Outdoor Black Motion Sensing Decorative Lantern is durably make of metal construction with a weather resistant finish. It is designed with clear bevelled glass to minimize light output. Functional and practical, this motion sensing lantern has 2 brightness levels and a 30 ft. detection range making it a dependable security lantern. Uses 1 - 100 Watt Medium Base Bulb (not included). 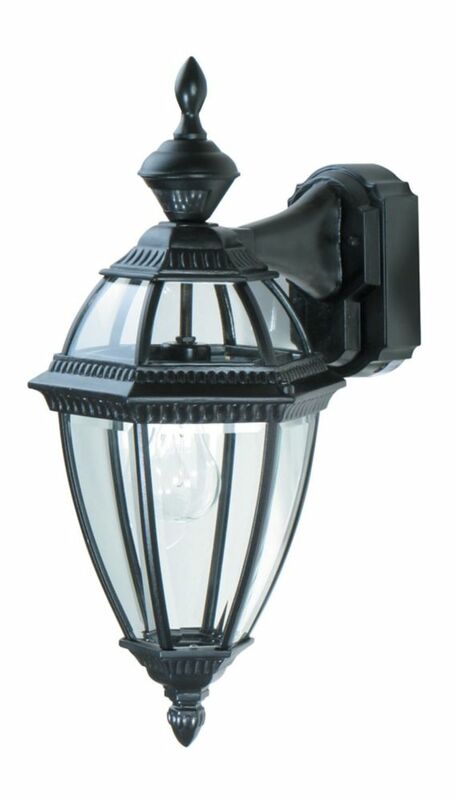 150 Degree Black 6-Sided Decorative Lantern with Clear Beveled Glass is rated 4.0 out of 5 by 2. Rated 3 out of 5 by Mrbud from These lights are cheaply made compared to a few years... These lights are cheaply made compared to a few years ago. The first one i bought and returned had the socket for light bulb just hanging. Wasn’t mounted like it was supposed to be. The second one has the upper glass portion loose. I kept it because at least it would work. Rated 5 out of 5 by Marta from Very satisfied, I just love the motion lights! Works wonderfully,... Very satisfied, I just love the motion lights! Works wonderfully, turns on when people pass by our porch on walkway or come up stairs to door eliminating any possible falls due to darkness.